Title: Comin' down the "Pass"
Description: 39 pairs must be empties? This is a grade out of the valley. Description: A rainbow consist heads towards MPLS Jct from the West. 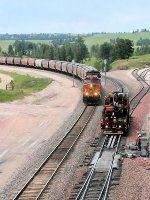 Description: BNSF Eastbound Freight Train H- GFDBRC ( Grand Forks, ND to Belt Railway of Chicago ) passing through Genoa, Wi. Description: BNSF Seattle, WA (UPRR Interchange) to Roberts Bank, BC, Canada loaded coal train C-SEURBE0-07A heads north at Spokane Street on the BNSF Seattle Subdivision - BNSF 4061, BNSF 4706, BNSF 4045, 104 coal cars (UP, CMO, and 1 AECX), and rear DPU BNSF 5355 - Train loaded by Savage Services Corp in Savage, UT - Operated UPRR Savage, UT to Seattle, WA, BNSF Seattle, WA to Westshore Terminals Ltd in Robert's Bank, BC, Canada. To the left, BNSF 2879 sits ready to switch Rabanco. Description: Westbound BNSF freight with three BNSF engines and one CP. Title: BNSF 5355, BNSF's Aurora Sub. Description: BNSF 5146 leads a westbound towards the endangered ATSF siginal bridges at west Baring. Description: The lead of three units on an eastbound freight rumbles across Barry Avenue as the hogger gets the train up to speed as it clear the Wayzata siding a mile to the west. Description: The hogger gets a wheel into an eastbound freight as it clears the Wayzata siding a click west of the Wayzata depot and approaches the Barry Avenue crossing and depot grounds with air horns sounding. Couple minutes after he cleared, it began to rain.